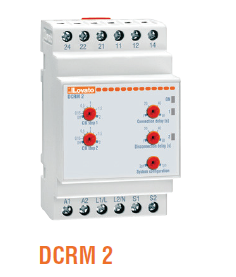 Lovato DCRM Series Automatic Power Factor Control For Power Quality Applications. The DCRM allows the reactive current of a system to be controlled. It can correct to the best cos phi value possible, reducing the request for reactive current from the mains. It can control the connection of two capacitor banks. Each one can be individually enabled and its power can be set through a dedicated trimmer. It is also possible to adjust the time for connection and disconnection of the capacitors, thereby modifying the reaction speed of the system. The controller can be used both in three- and single- phase wiring. – Auxiliary supply voltage: 380…415 standard; 220…240VAC and 440…480VAC on request. – 80…528VAC voltage measurement input. – Current measurement input: by CT/5A, measuring range = 0.1…6A, True Root Mean Square measurement, automatic identification of CT connection polarity (straight / inverted). – Relays Outputs: 2 relays (steps) each with 1 changeover contact, rated current is 8A 250VAC (AC1), individual enablement of controls of the two relays. 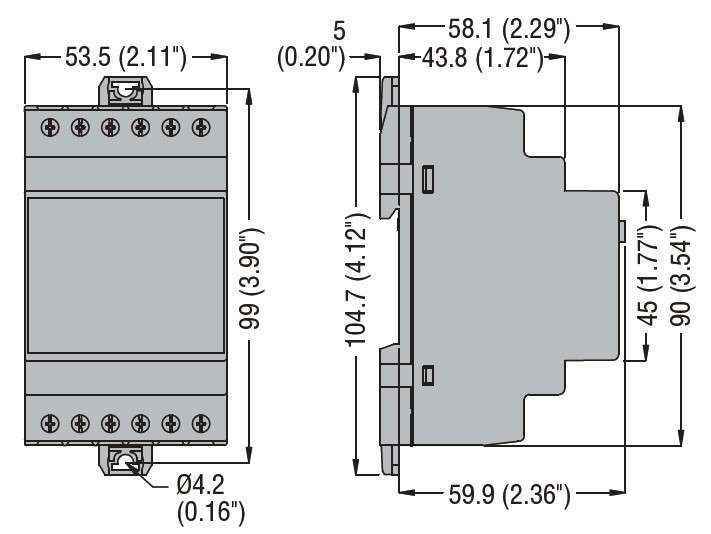 – Modular DIN 43880 housing (3 modules). – IEC degree of protection: IP40 on front (if placed in IP40 housing and/or electrical panel), IP 20 terminals.